Russia recorded another 7-0 victory on Sunday, thrashing newly-promoted Austria to make it 14 goals in two games and none conceded. The other leading contenders for medals in Denmark also won: Sweden took a 3-2 verdict against the Czech Republic, while Canada bounced back from its opening day defeat against the USA to wallop 10 unanswered goals past Korea. Latvia had a tough evening, losing to Finland. For the second game running, Russia powered to a 7-0 victory. 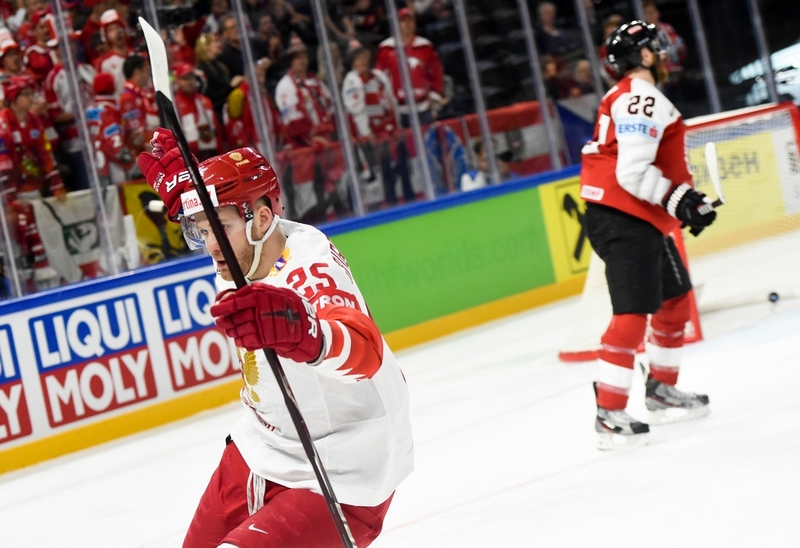 This time, Austria was the victim, battered by two goals from Mikhail Grigorenko, tormented by a moment of magic from Pavel Datsyuk and hit by first-ever World Championship markers for Avangard’s Ilya Mikheyev and ex-CSKA man Maxim Mamin. As well as the Russian attack snarling with menace, the defense also looks solid. In two games, Ilya Vorobyov’s team has allowed just 21 shots. Igor Shestyorkin, taking his World Championship bow when he replaced Vasily Koshechkin in the third period, faced just four as he made a flawless start to life at this level. “It felt like playing Austria was harder than the game against the French, but any team here can cause problems,” added the former SKA forward. Sweden, widely anticipated to duke it out with Russia for the Group A leadership, also picked up a second win in Copenhagen. The Tre Kronor outlasted the Czech Republic to win 3-2 with the top line of Mika Zibanejad, Rikard Rakell and Mattias Janmark sharing all three between them. Once again the Czechs rallied after trailing by two but there was no repeat of Saturday’s last-gasp equalizing goal against Slovakia. 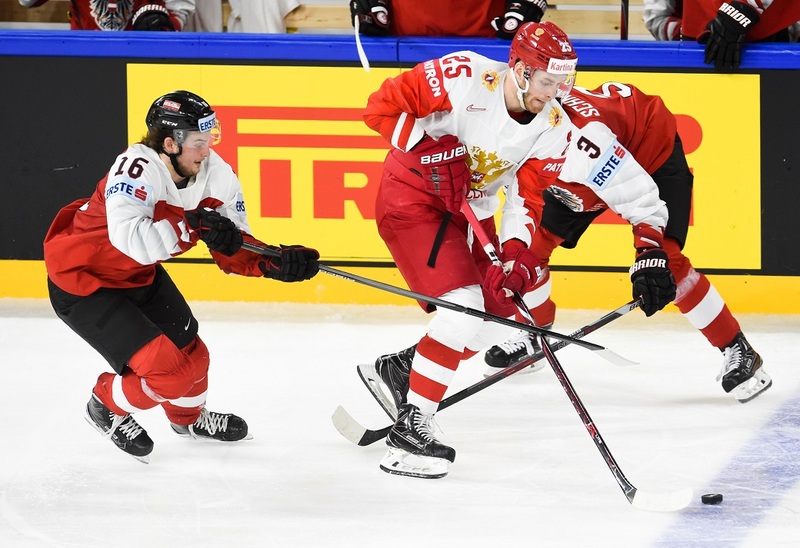 In the evening game, Switzerland picked up a 2-0 victory against Slovakia, moving to five points and climbing to third in the group behind Russia and Sweden. Veli-Matti Savinainen was on form for Finland as the Leijonat made it two wins from two. Kunlun Red Star’s new signing had a goal and an assist in the first period to put his country in control against Latvia in Group B. He got another goal in the second as Finland eased to a 8-1 victory. Sebastian Aho led the scoring with 2+4 while Dinamo Riga’s Roberts Bukarts got the consolation goal for the Latvians. Like Russia, Finland has recorded back-to-back victories by the same seven-goal margin. Earlier in the day, Canada thrashed Korea 10-0 before Norway edged Germany 5-4 in a shoot-out. The Germans have now suffered back-to-back losses in their first tournament since that Olympic sensation in Korea.